Top cinematographer PG Muthaiah directs the film. I feel proud that my son Shanmugapandian is acting in a movie titled Madura Veeran, which is the powerful title of legendary MGR’s blockbuster film. 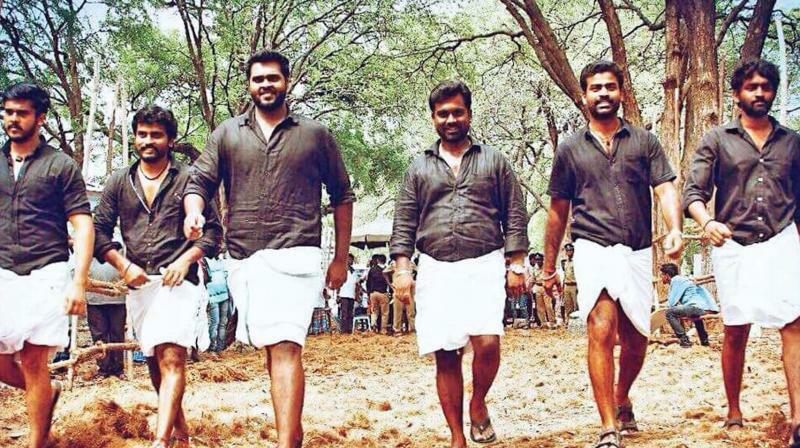 And this film is based on jallikattu, which is a valorous sport of the Tamil people,” remarked Premalatha, wife of actor- turned-politician Vijayakanth at the audio launch of the film. Top cinematographer PG Muthaiah directs the film. While Meenatchi is the heroine, Samudhrakani essays a crucial role in the movie. ‘Captain’ Vijayakanth, who is attending a filmy function after a gap, looked fit and with renewed vigour! “Since it’s my son’s movie, I don’t want to talk much about him. I was very impressed with the script that deals with Jallikattu. Hence I was keen on Shanmugapandian doing the film,” he shared. Music is by Santhosh Dayanidhi and one of his songs Enna Nadukkudhu Natla became a huge hit and all the parties, including AIADMK and DMK, used it as a propaganda song during the recent RK Nagar elections. Producer LK Sudeesh revealed this at the event. Venkat Prabhu, who was also present on the occasion, shared his dream of directing Vijayakanth and also said that he hopes to do a project starring his son soon. Fittingly, the film is slated for a Pongal release.